Java is the most popular programming language today. For this reason, regularly tuning your Java programming skills is essential. Java is used in all web and mobile applications. Therefore, as a Java Programmer you have more job opportunities in the IT sector. 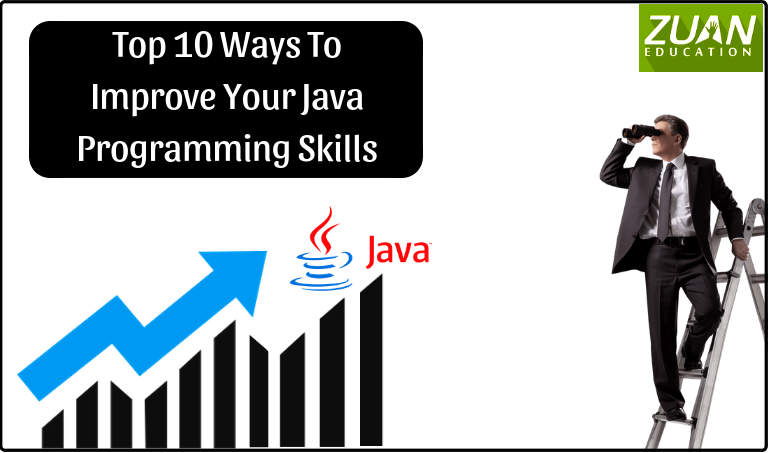 You should have the following 10 skills to become a better Java Programmer. Apart from the above, JDK 9 has various modules, Jigsaw, Reactive Streams, Process API, HTTP2 client, and JShell. It also has API improvements like collection factory methods. Similarly, JDK 10 brings var to give you a flavor of dynamic typing and some GC improvement. This is also important as a Java programming skill. Most of the companies prefer to do development using Spring frameworks. This is a vital Java programming skill. This involves aspects like Spring MVC, Spring Boot, and Spring Cloud for developing a web application, REST APIs Microservices. This Java programming skill promotes best practices like dependency injection. This makes your application more testable which is important for modern-day software. If you are already familiar with Spring then you should explore Spring Boot and Spring Cloud. This will help in developing next-generation Java application. Learn Spring 5. It has features like the reactive programming model. As a professional Java programmer, you write unit tests for your code. This will be visible in your code and tests. This is an important Java programming skill. Hence, you have a lot of new framework and tools available for Java programming to unit test and integration test applications. For example, Mockito and PowerMock for mocking objects, Robot Framework, and Cucumber for automated integration test. And, of course, the new and shining JUnit 5 library. Invest your time upgrading your unit testing skill. This will help you become a more professional developer sought after by companies. As a Java developer, you should have an overall knowledge of the Java Ecosystem and APIs forms. This is an essential among the Java programming skills. You are not expected to know all of them but you should be familiar with some key APIs. For example, JSON processing APIs like Jackson and Gson. XML processing APIs like JAXB and Xerces. And unit testing libraries like Mockito and JUnit etc. Even if you are a beginner in Java Application Development you must have some working knowledge of Java Virtual Machine (JVM). This is another crucial element among the Java programming skills. Also a crucial element of JRE (Java Runtime Environment). You can solve complex problems during programming by learning JVM. Apart from the above, learn how JVM works, JVM system threads, how JVM executes JAVA bytecode, and the order of execution. Also, learn key aspects such as JVM stack restrictions and other common mistakes that most of the Java Developers make. All these will add to you various Java programming skills. This is important in software development. And one among the chief Java programming skills. Design pattern shows you the relation between classes and object. Therefore, a systematic naming of the objects and classes helps in addressing the recurring problem in the object-oriented systems. As a Java programmer you should know and incorporate design patterns in your code to make the application flexible and changeable. Learning design patters has two goals. First, to identify and understand the problem in the application and associate it with some pattern. Secondly, the reuse of old interface or make the existing design more usable for future purposes. You should have a knowledge of DevOps. This is another area in the Java programming skills. And be familiar with continuous integration and continuous deployment and how Jenkins helps to achieve that. Learn more about DevOps in general and tools like Docker, Chef, Kubernetes etc along with Maven and Jenkins. Learn Kotlin. It’s a great language from JetBrains, the company behind IntelliJ IDEA. And also official language for Android development as announced by Google in 2017. It helps in your productivity and also into Android development area. Architecture is changing constantly. Many companies are moving from monolithic application to microservices. Therefore you have to learn, Microservice architecture and how to create Microservices in Java. On the other hand, Spring framework provides Spring Cloud and Spring Boot which greatly simplify microservice development in Java. You can start learning Master Microservices with Spring Boot and Spring Cloud to start with. Learning IDE is vital. IDEs like Eclipse, NetBeans, and IntelliJ IDEA are a most important tool for you. Having good Java skills is essential. Enhanced coding skills in Java world will help to write code better and solve problems. Java programming involves various aspects like open source projects, data structure, object-oriented programming and more. If you are a beginner in learning Java and want to learn more, there are also a lot of online resources where you can learn Java. Furthermore, why don’t you have a better career score by getting Java training offered in main cities in India? And especially, if you are put up in or around Chennai you can learn Java course in Chennai from reputed IT institutes. It could be better to write more information about how to improve the writing skills of the Content writer.